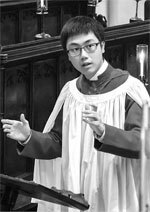 Jordan Wong was born in 1996, and is the Senior Organ Scholar of Jesus College Cambridge, where he is in his third year reading Classics, holding the Prince Philip Scholarship. His daily roles include accompanying the two choirs, assisting with the training of the choristers, and conducting rehearsals and services. Originally from Hong Kong, Jordan had some organ lessons at Ying Wa College, before going to Monmouth School in 2009, where he was the Malcolmson Organ Scholar, studying with David Lawson. There he played and sang for chapel services, accompanied and occasionally conducted the Chapel Choir; with them he has been involved in the premieres of pieces commissioned by the School, such as Colin Mawby’s O God of Battles, and The Truth Sent from Above by Alan Bullard, which he conducted in December 2014. During his schooldays, he also regularly played for Sunday Eucharists at St Peter’s Church, Dixton. Jordan was a répétiteur for the School’s Choral Society, covering works such as Mozart’s Great Mass, and for the Cambridge University Opera Society’s production of The Marriage of Figaro. He is an Associate of the Royal College of Organists, and has played in venues such as St John’s and Trinity Colleges, Cambridge, St David’s Cathedral, as well as the Basilica of St-Nazaire-et-St-Celse in Carcassonne. With various ensembles, Jordan has toured in Spain, Morocco, Malta, and Italy. He has studied with Gordon Stewart, and currently with Ann Elise Smoot and David Briggs. Jordan also plays the piano, beginning lessons at the age of three. He has performed Tchaikovsky’s Piano Concerto No 1 with the Wye Sinfonia at the Wyastone Concert Hall. In February 2018, he was one of the soloists in Mozart’s Piano Concerto No 10 for two pianos with the Jesus College Music Society orchestra, of which he is a Junior Co-President in his final academic year. Within the same term he also played continuo for Bach’s Brandenburg Concerto No 3 and St John Passion. Jordan was involved in the percussion section of the Senior Symphonic Winds in Monmouth; at Cambridge, he has played percussion for the Cambridge Greek Play in 2017, and now plays for the Jesus College Music Society, of which he is a Junior Co-President.